A shimmering knot on their wrist will remind them of your strong bond and endless love. Like a ship moored to a dock, your loved one is there for you every step of the way. Let them know you're there for them, too, with Trang Dai Nguyen's recycled sterling silver bangle. 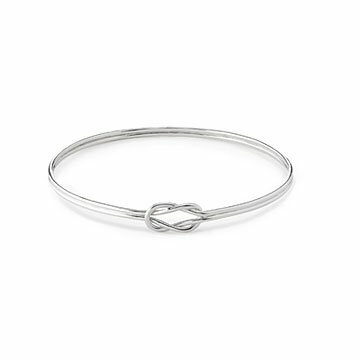 The knot symbolizes your strong bond, and the circular shape represents your endless love. Send one to your best friend, a new mom, or your own mom so they can wear a constant reminder of your unique relationship. Handmade in Canada. When Trang Dai Nguyen is dreaming up new designs, she has a specific woman in mind: dynamic, adventurous, and a bit romantic. Trang uses traditional metalsmithing techniques to create her modern, delicate pieces one at a time. She’s fascinated by transforming metal into new shapes like twists and knots. She lives and creates in Canada.